Is it day three already? Wow - time flies! 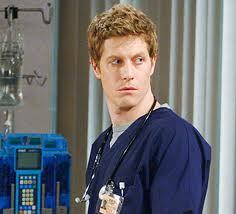 Today's theme is As The World Turns, which is where the majority of us were introduced to Eric Sheffer Stevens. Learn how Dr. Reid Oliver impacted Eric's life/career, how some of those character quirks came about, and what he REALLY thinks of the Cartoon Saga. Enjoy! Would you say that the role of Dr. Reid Oliver opened doors for you, limited you, both, or neither? It remains to be seen what kind of doors it might open, but it was a great opportunity, and it can only be good. There’s nothing that’s limiting about it. Because it was such a character role, and also because it was just less than a year. It would be pretty impossible for me to be stereotyped. It was actually great for me as far as other things I’ve done, to have a guy like that in my body of work. Because of how bizarre and specific he was written. So yeah, for me, it can only be a really great thing. Were you surprised by the reception for the character, or the attention that you got for the role? On paper I can see it looking like, “oh, secondary character in a secondary storyline, couple of days a week, a good, solid few months of work, steady income” kind of a thing. A great character, a lot of fun to do. Yeah, that was all exactly my reaction. And then, all of a sudden did it feel like it exploded on you? In a good way? It was very surprising. I was pretty unaware of it for a while. Just [noticed] that they kept me working and brought me more and more into the world there. It was just a lot of fun. And that he got so popular was very surprising to me and very unexpected. And, obviously, you think you’re just going along and … it was just what you said. They said two or three months. I’m not sure what they thought the storyline would be, but that character would be around for two or three months. And I thought, “that’s fantastic! That’ll be so much fun.” And then that they wanted to keep him around indefinitely was such a surprise. A welcome surprise – it was a happy thing. That was a character I could have played for…I would have been happy to go on longer with it. We would have been happy to watch it, too. My friend Maia and I live in different cities, but we always watched the show together. We’d get on IM and chat while we were watching. I used to joke that it was time for Master Class, because we loved seeing the choices you would make for the character. Line deliveries, or bits of stage action, it was like, “Oh, my God, I never would have thought of that, but it’s perfect.” It was really enjoyable. Let you drink somebody else’s lemonade. Yeah, right. [laughter] That one was an odd one. I’ve talked about this before, but we had to redo it, because one of the cameramen started laughing. It was just so random. Excellent. [laughter] You know it works when you can get the crew to break. Or it’s just that bad. It could be that as well. Have you been approached by any other soaps since the end of As The World Turns? Yes, two. They were contract roles. I remember they were described as “nice”. And I said both times to my agent, “Wait, wait, stop.” So, neither one of those seemed right, but I’m definitely open to it. It depends on what would come along. I have to say as someone who has done some theater, I completely get where you’re coming from. Because the nice characters are not as interesting to play. And there’s a lot of them, and they just sort of move through the story. I know I would be really bored. And that’s a really bad place to be. Just not feeling challenged. I’d be miserable, my family would hate me, I’d be very crabby. So that’s something I have to think very seriously about. I remember being offered a role in PICNIC, down in Baltimore. This is right after Trent and I worked down there together. It was for the role of Alan, who is the nice guy who gets jilted. The hunky guy, Hal, you know, the William Holden part, that’s the fun role to play. I’m not right for that, but I also didn’t want to play the nice guy. It would just be really … this is coming out wrong. I don’t have anything against being nice. At all. In life. And there are plenty of nice characters. But there are tons of parts where that’s their only function is to be the nice guy, so the other person can be interesting. That’s what I’m talking about. So I passed on that. So I called back and said, “Uh, okay.” And I took a train that day, and the director took the train with me. I rehearsed that night, and then I rehearsed the next day, and went on that next night with a book in my hand. It was terrifying. And that was fun. The character wasn’t the challenge, the circumstances were. I went on twice with a book and the third night, the Friday night, I did it off-book. That was another scary, horrible night. And I got through. It was fun. And after playing that part for a week I was completely bored. But the whole first week was worth that. The cartoon saga. I know you’ve heard of it, or been made aware of it. Oh, I’ve watched a lot of them. Yeah, it’s hilarious. The Mistake is my personal favorite because it’s based on the first time we talked, on that radio call-in when I asked about the Shakespeare plays. The one with Yorick? Yeah. Those cartoons are hilarious. They’re so smart. They’re ridiculously smart. I think my favorite was the Bad Hair Day. The continuity one. That was genius. So funny. There have actually been major posts on that (subject). Oh, yeah. We had to shoot one scene, [where] we were making out, at the end of one of the episodes and the beginning of the next. And we never did the other episode until a month [later] because of some snow day or something, I don’t remember what happened. And he got his hair cut. I was like, “what are you doing?” And he said, “Yeah, it wasn’t supposed to be this short.” So then they’re trying to push it forward or something. Trying to make it all look [the same]. That was one where I knew it wouldn’t work right away. There were a lot of conspiracy theories about that – were there reshoots, are they trying to make it hotter or what? No, no reshoots. Just a scheduling thing. Your hair grows. When you wait that long to shoot the next scene, it’s going to look a little weird. The joke making the rounds was that it was such a hot kiss, not only did it shorten Luke’s hair, it dried Reid’s hair. [laughter] Yeah. That’s something they let go of, a little bit. It must be cool to have something like the cartoon saga created around a character you developed. Oh, yeah. Of course it is. Guess what? Tomorrow is the last day! So be sure to stop by to see what's on the horizon for Eric! I've already squeed over this on Twitter, but it bears repeating. Oh the Cartoon Saga! I never expected it to get so big! And though we don't share the same favourite, this has cheered me up on a very cold, snowy day indeed. I don't want to say any more on it, but OMG. Van's hair and it's wacky continuity was always one of my favourite things about ATWT. And I would love a job where I get paid to eat. I totally agree about the nice characters thing. Back in the days I did theatre, I got the option in a play of playing either a priest or Jesse James. You can guess which one I picked. Nice characters can be good, as long as their whole purpose isn't just to be nice, and there's a hint of something nicer. And yes, I base my entire opinion of interesting nice characters on people from Doctor Who. Again, squee. I really need to get started on the Cartoon Sequel. Katie great segment today as well. I always loved all the cartoons myself, they did certainly cheer me up during the difficult times in the end. And Van's hair, stories will be told about that forever... lol. The interview today made me laugh so much. Seeing that kiss again... WOW. I do miss them. And the lemonade scene. Knowing that it was something that Eric just did on his own just makes it that much better. Since learning of that in one of his interviews I have never watched that scene the same again. It was also nice to hear about the role he took at the last minute in PICNIC. I can see him pulling that off. Thanks again Kate. I look forward to the final part of this interview. First of all, the Cartoon Saga...what can I say? I just commented on it on LJ and Facebook, and Colleen, my daughter and I were watching episodes the other night. I loved the one that he mentioned was his favorite, but we had different favorites. Mine is the Ninja one. In any case, they're brilliant and I'm glad that he loves them as we do! Secondly, I always loved the liberties he took with the character and the script. I asked him about it on the first radio interview, too, but I didn't mention the lemonade specifically. That was genius! Lastly, I can totally understand his wanting to do something "not nice" so that it would be challenging and fun. However, what I'm hearing is we had the opportunity to see him on our TVs regularly again and he turned it down! Arrrrgggghhhhh!!! Great job, Kate. Great questions again! Can't wait for tomorrow, but I'll be sad it's over. Do I smell a second interview? Thank you for the wonderful interview. I'm so happy to hear that two other soaps have already approached him and that he's open to them. That means we may have the privilege of seeing him again on a regular basis. I wish it could be as Luke and Reid or them together as different characters on a soap. When you were speaking to him did you get the impression that he understands how soap fans get invested in a couple? Do you think he knows that Lure fans were so invested it changed the course of the show? And do you think he knows that we are still writing and reading fanfiction about them because we are still invested? I never get the sense from his interviews that he really understands the effect his character had on the fans. Is that your take, too? Thank yo so much for asking about that episode (2nd/3rd kiss)--I needed to know what happened there with Van's hair. And I'm kind of sad that he would've liked to play Reid longer--if only. It's also interesting to note that he doesn't like "nice" roles too much, so he'll probably take on more complex roles in the future--something to look forward to. Glad he watched the cartoon saga. I'm very much enjoying these interviews, and I look forward to the last two installments! This is a good interview. I particularly liked the explanation of what motivated him to take the role of Alan in "Picnic," why niceness, like manners, is sometimes overrated (at least in acting projects and fictional dramas), and that he actually turned down two "nice" characters. I equate the description "nice" with dull and uncomplicated, a rather uninteresting way to follow his character on ATWT. Thanks for this interview. Can't wait for the final parts! Pity Eric turned down contract roles but that's purely selfish on my part. Loved the bit about Van's hair and the cartoon saga. Is it possible to love part 3 exponentially more than the first two? He is such an interesting subject. Normally, I don't read actor interviews, but ESS is absolutely the exception. He makes it all so interesting. And while I'm a little sad that I won't be witness to his wonderful talent on a weekly basis, I'm happy that he opted out of doing the soaps offered to him. Not because I dislike the genre, but because, currently, I really can't think of one show (writing wise) that's worthy of his talent. Just as he'd unhappy trapped in an unsatisfactory role, I'd hate having to watch him trapped in such a role. Again, KD, you've done a wonderful job in making the reader feel a part of the actual interview. Kate, thank you again SO MUCH for this interview. It's all been so delightful to read! I loved hearing him talk about the cartoon saga - not sure if I could pick just one favorite myself, but the bad hair day one is hilarious! It's great that he's been offered some more daytime, but by the sounds of the characters - I have to say I agree with him on the "nice guy" roles. They are so incredibly dull when it comes to television. I can't imagine Eric ever being dull, even in that kind of role, but still - I completely understand what he means. Nice characters don't allow for a whole lot of depth. You asked him such fantastic questions. This interview is great - I'm so sad it will be over tomorrow!!! So in agreement about the nice character thing. Nice is BORING. And I've only ever watched a few eps of ATWT, but it was interesting what he was saying about getting away with stuff when you're more of a secondary character - having more freedom and all that. I know you don't get a whole lot of leeway like that on most telly productions, so it's cool that he got to contribute that much. And even just watching from the fringes, I was gleeful that his character got so hugely popular in fandom, just because I find it to be such an awesome phenomenon when the status quo gets messed with and fringe characters attract their well-deserved following. Too bad TPTB butchered it so badly, but all the best to him. He seems like such a lovely, sharp bloke. Kate, Thank you for the interview.It was great to have some different questions asked of Eric. Eric,Thank you for giving so much of your time for interviews.Thank you for giving us Reid and yourself.It is also a pleasure to watch you perform your talent in acting in anything you do. Can't wait to see more. I just love this interview so much! You did an awesome job, Kate! I'm glad he put all the conspiracy theories to rest about that one. It's so great getting the behind the scenes info. And I think since he's so far removed from the experience, it's easier to talk about more freely. Another great installment. I smiled at this answer because his speech pattern sounds like the ESS I've come to know in his other interviews. I'm glad that he's been noticed so that he's being offered things. I hope he finds a role that matches his interest and talent. I love the lemonade story and I know we all love the scene. It's always sweet that he has such lovely things to say about the cartoons, especially because it seems very genuine. I want to add that I love your question where you called your viewing "Master Class". I often felt the exact same way. ESS was always doing something interesting that seemed like his contributing to the scene. It makes Reid endlessly interesting to watch. The Story of "Hi Kate!"